Bst 2.0 DNA Polymerase is an in silico designed homologue of Bacillus stearothermophilus DNA Polymerase I, Large Fragment (Bst DNA Polymerase, Large Fragment). Bst 2.0 DNA Polymerase contains 5´→3´ DNA polymerase activity and strong strand displacement activity but lacks 5´→3´ exonuclease activity. Bst 2.0 DNA Polymerase displays improved amplification speed, yield, salt tolerance and thermostability compared to wild-type Bst DNA Polymerase, Large Fragment. Performing LAMP reactions with increasing amounts of salt demonstrate increased resistance to inhibitors by using Bst 2.0. 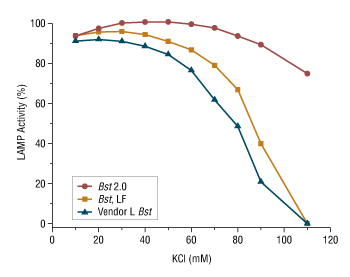 Bst 2.0 maintains high levels of activity where wild-type Bst DNA polymerase, large fragment, is completely inhibited. LAMP reactions amplifying different targets demonstrate a more rapid amplification threshold time using Bst 2.0 vs. Bst, large fragment. Bst 2.0 DNA Polymerase is prepared from an E. coli strain that expresses the Bst 2.0 DNA Polymerase protein from an inducible promoter. Bst 2.0 DNA Polymerase does not exhibit 3´→ 5´ exonuclease activity. Bst 2.0 DNA Polymerase cannot be used for thermal cycle sequencing or PCR. Specific reaction conditions will vary for different isothermal amplification applications. For best results, use 1X Isothermal Amplification Buffer. What is the difference between Bst DNA Polymerase, Large Fragment and Bst 2.0 DNA Polymerase? Why would I use Bst 2.0 WarmStart® DNA Polymerase? Can Bst DNA 2.0 Polymerase be used in other NEBuffers? Can Bst 2.0 DNA Polymerase be used to blunt DNA? Can Bst 2.0 DNA Polymerase be used to fill in 3' overhangs? Can Bst 2.0 DNA Polymerase be used to remove 5' overhangs? Can Bst 2.0 DNA Polymerase be heat inactivated? What are the main causes of reaction failure using Bst 2.0 DNA Polymerase? Does Bst 2.0 DNA Polymerase have an active 3'→5' proofreading exonuclease? Can Bst 2.0 DNA Polymerase be used in applications requiring thermal cycling? Can Bst 2.0 DNA Polymerase initiate at a nick in the DNA? Can Bst 2.0 DNA Polymerase be used in labeling reactions and partial fill in reactions? Can Bst 2.0 DNA Polymerase be diluted? When should Bst 2.0 DNA Polymerase be the enzyme of choice? Can Bst 2.0 DNA Polymerase be used at temperatures other than 65°C? Does Bst 2.0 DNA polymerase incorporate dUTP? Does Bst 2.0 DNA polymerase have reverse transcriptase activity? NEW ENGLAND BIOLABS® and THERMOPOL® are registered trademarks of New England Biolabs Inc.
WARMSTART™ is a trademark of New England Biolabs, Inc.